Local vintages are earning new respect. I remember my first taste of Georgia wine, years ago: I was in a small gift shop in “alpine” Helen during (what else?) Oktoberfest, and was offered a Dixie cup filled with complimentary “Muscadew.” I took a sip and, well, Muscadew . . . ew. 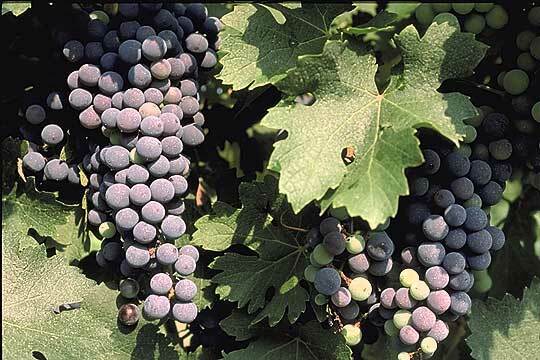 Good drainage is the key to premium wine grapes,” Harris says. “We get a much higher amount of rainfall throughout the growing season-big thunder-boomers-but since red clay doesn’t take water real fast, the vines have the sense of being in a drier condition than they really are.” If you’ve jumped on the locavore bandwagon, you may already be drinking Georgia wine. Besides the reduction in carbon footprint (that imported Bordeaux comes at a cost to both you and the planet), some insist local wine just tastes better with local food. Several area chefs, including Restaurant Eugene’s Linton Hopkins and Aria’s Gerry Klaskala, have partnered with northeast Georgia wineries, such as Tiger Mountain Vineyards and Persimmon Creek Vineyards, to showcase how local food and wine go together. This month-the peak of the harvest season and the start of fall-is an ideal time to visit a northeast Georgia winery. Here’s a tasting. Planted in 1997, BlackStock was Dahlonega’s first vineyard. Today, owners David and Trish Harris produce mostly red wines and are the largest producer of premium wine grapes in the state (supplying Habersham Winery, among others). David, who has a viticulture and enology degree from Fresno State University, is the winemaker. BlackStock’s bestselling wine is its 2005 ACE-A Family Reserve (a blend of Touriga, Mourvèdre, and Merlot), which is named after the Harrises’ three children, Austin, Chandler, and Eliza. Tasting room open daily ($10 to taste eight wines); vineyard tours available by appointment. This French-style resort is the state’s largest wine producer, bottling more than 20,000 cases per year. In addition to tastings and tours of the 42,000-square-foot winery, guests can dine at two winery restaurants or participate in a Saturday culinary demonstration in the new Viking culinary studio, which features food from executive chef Marc Suennemann and wine pairings from winemaker Peter Kasprzak. Noted: Four Château Élan wines recently named “Great Buys Under $40” by Wine Spectator: Essence de Cabernet Founders Reserve, Chambourcin Nouveau Georgia, Merlot Founders Reserve, and Viognier Georgia Founders Reserve. Winery tours and tastings offered daily, $10 on Saturday, $5 Monday-Friday and Sunday; customized group tours also available; Saturday culinary demonstration, $20. Owner (and Atlanta native) Eric Seifarth became passionate about wine in northern Italy, where he was stationed as an Army officer for ten years. Upon retirement in 1995, the West Point grad planted this vineyard in Young Harris with his wife, DeAnne, who is also a veterinarian. While the eighteen-acre vineyard is smaller than others in Georgia, it is the state’s northernmost vineyard, which brings other benefits. “Our cooler summer nights particularly lend themselves to whites,” Eric says. “Plus, we have a longer growing season.” Crane Creek recently released “a bone-dry version of Gewürztraminer,” he says. “I think it’s one of our best efforts.” Crane Creek’s bestsellers include its Sweet Sally, a sweet white wine made from Catawba grapes and named after the owners’ Labrador retriever, and the Hellbender Red, which is made from 100 percent Norton grapes. Noted: Brasstown White Vidal Blanc and Mountain Harvest Red (Chambourcin) recognized at Wines of the South competition. Expect crowds in the tasting room at this scenic winery that sits high on a hill in the small Frogtown community of Dahlonega. Opened in 1998 by Atlantans Craig and Cydney Kritzer, Frogtown’s forty-acre vineyard is spread out among picturesque steep slopes and includes eighteen different grape varieties. Tastings are offered by wine type (red, white, or pink), and since there are quite a few of each to sample, we recommend sharing. The Kritzers recently planted twenty acres of Muscadine and Florida hybrid grapes in Hahira, Georgia, and plan to open a tasting room there later this year. Noted: 2004 Frogtown Viognier awarded gold medal at 2007 Long Beach Grand Cru competition; Kritzer Family Reserve (Cabernet Sauvignon) awarded gold medal and named best of class at 2007 Atlantic Seaboard Competition; 2005 Frogtown Touche awarded gold medal and named best of class at 2008 Atlantic Seaboard Competition. Tastings offered Thursday-Sunday, $10-$12 per type. Located just outside Helen, Habersham is one of Georgia’s oldest wineries (opened in 1983) and largest wine producers, making more than 15,000 cases annually. While there is no vineyard at the winery, Habersham occupies two vineyards elsewhere in northeast Georgia and also sources grapes from BlackStock Vineyards (most notably the Viognier) and muscadines from South Georgia’s Still Pond Vineyard. Noted: 2006 Creekstone Viognier named best white wine in Georgia at 2007 Georgia Trend wine tasting and awarded silver medal at 2007 VinoChallenge International Wine Competition; 2005 Creekstone Cabernet Sauvignon awarded gold medal at 2007 VinoChallenge International Wine Competition. This vineyard was planted in 2000 by dermapathologist William “Sonny” Hardman and his wife, Mary Ann, on land that, according to the family, once produced some of the state’s best white lightning (moonshine). Today, Sonny minds the vineyard while Mary Ann splits her time between working at Persimmon Creek’s new tasting room, Persimmon on the Square in downtown Clayton, and spreading the local wine gospel to area restaurants. “What grows together, goes together” is her mantra, and restaurants such as Bacchanalia, Joël, and all three Georgia Ritz-Carltons are believers (as well as Quince, in San Francisco, and Aspen’s The Little Nell). The property also features a large vegetable garden and fourteen-year-old son Mitchell’s wind turbines (used to power his room) and high-profit pumpkin patch (“he made $2,500 last year on his pumpkins; this year he wants to double it,” says Mary Ann). Noted: Named one of the top 10 “Fastest Improving Producers” in U.S. in Wine Report 2008; 2007 Seyval Blanc named one of Sommelier Journal’s “Hot Picks”; 2005 Late Harvest Riesling awarded bronze medal in 2007 San Francisco Chronicle Wine Competition. Tastings offered at Persimmon on the Square Monday, Tuesday, and Thursday-Saturday, $8 (with a $5 credit toward wine bottle purchase). Noted: Vintage 2004 Merlot Private Selection awarded bronze medal at 2006 Wines of the South Competition; 2006 Pinot Noir, Cabernet Franc, and Cabernet Sauvignon all awarded bronze medals at 2008 Finger Lakes International Wine Competition. Tours and tastings offered Friday-Sunday (other days by appointment), $5. Named after nearby Three Sisters Mountain (which can be seen from the vineyard), Three Sisters is “all about Georgia,” says Sharon Paul, who founded the vineyard with her husband, Doug, in 1996. “We’re not trying to be France or Italy,” she says. Accordingly, Southern folk art is on display in the tasting room, where the staff members (mostly family) pour wines from three labels: Three Sisters Vineyards, Chestatee, and Walasiyi Wine Company. Three Sisters is best known for its Fat Boy Red (a blend of Cynthiana and Bordeaux), and just released the first Fat Boy White wine (a blend of Chardonnay, Vidal Blanc, and Pinot Blanc). Noted: Georgia Port named “Best Dessert Wine” in 2007 Georgia Trend wine tasting. Free tastings offered Thursday-Sunday (other days by appointment); specialty tasting and tours available for $10. Winemaker John Ezzard was the first to plant European wine grapes in northeast Georgia (in 1995), despite doubts from surrounding farmers that the grapes would thrive. Today, Ezzard-along with his wife, Martha, and partners Bill and Leckie Stack-produces some of the most award-winning wines in Georgia, including the only Georgia-grown Malbec and Petit Manseng. Tiger Mountain wines are served in top Atlanta restaurants such as Restaurant Eugene, Aria, and The Dining Room at The Ritz-Carlton, Buckhead. Noted: 2005 Cabernet Franc awarded gold medal and 2005 Rabun Red awarded silver medal in 2007 VinoChallenge International Wine Competition; 2006 Petit Manseng awarded gold medal in 2007 Jefferson Cup Invitational and silver medal in 2007 International Eastern Wine Competition. Free tastings offered daily through November; weekends only December through April; vineyard tours available by appointment. This hillside vineyard was planted in 2000 by the Boegner family (father Karl is the owner and winemaker; son Brannon is the assistant winemaker and manages the vineyards). Wolf Mountain focuses on red wines-it sources white wine grapes from neighboring vineyards-and recently released three sparkling wines (Brut Rosé, Sparkling Demi-Sec, and Blanc de Blancs Brut), the first in northeast Georgia. The 8,000-square-foot, Craftsman-style winery includes a cask room and cellar, and offers a wine-paired lunch Monday through Saturday, Sunday brunch, and ongoing winemaker’s dinners. Noted: Plenitude (a blend of 70 percent Chardonnay and 30 percent Viognier) awarded silver medal at 2008 San Francisco Chronicle Wine Competition and best of category for blended whites at 2007 Vinifera Wine Growers Competition; Instinct (a Rhône-style blend of Syrah, Mourvèdre, Cabernet Sauvignon, and Touriga Nacional; 2006 vintage) awarded bronze medal at 2008 Los Angeles International Wine & Spirits Competition and best of category for blended red at 2006 Vinifera Wine Growers Competition. Tastings offered Thursday-Monday, $10-$15; winemaker tours offered Saturday and Sunday at 2 p.m., $15 (includes tasting).